The Ipsos MORI poll due to be published in today’s Evening Standard has caused ripples today as it shows support for Labour at a record low since 2010. Despite this quite momentous rise in the polls the Ipsos MORI write up of the results does not mention the Green Party once. UKIP by contrast (down 2% at 14) get four mentions in the write up. 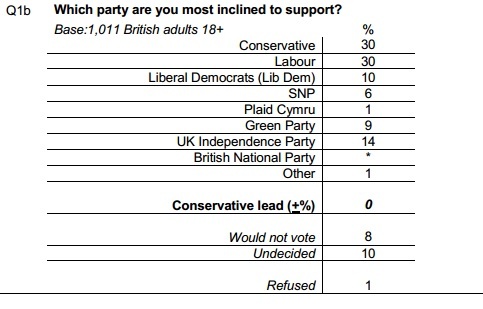 The Liberal Democrats (just one percentage point above the Green Party at 10%) equally also get four mentions. Frustratingly, it is from this text that lazy journalists will copy and paste their articles not bothering to look at the data tables behind the polls (something which I have to do if I want to find out how the Greens are doing). If they did, I am sure that they would use the headline finding of this poll (Labour being on a long-term low) but equally is it not noteworthy that the Greens are reaching such competitive heights?